This was a proposal for a competition for an 8-unit condominium in Tomisato City, Chiba Prefecture. (※2nd place) The requirement was “a proposal that allows a new kind of suburban lifestyle for 8 units living together.” Our proposal was for housing lots with large roof terraces that make use of the surrounding green environment. By connecting the roofs of four units in a Buddhist cross pattern, each unit is able to have its own roof terrace. The idea behind typical row housing is that sharing a wall would lead to greater yard space. In this proposal, sharing the roof leads to heightening the spatial quality and size of the roof terraces. 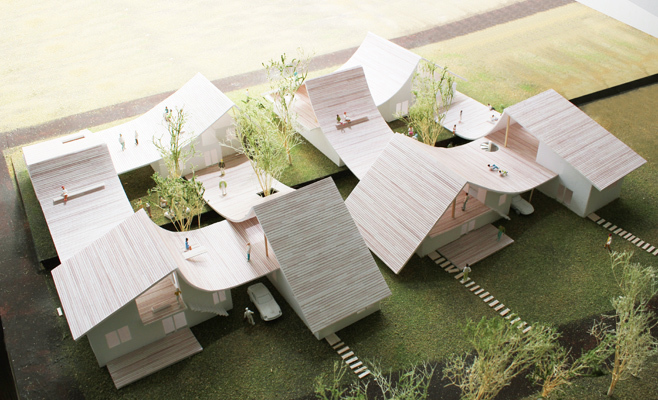 The roof-terraces fold around a courtyard planted with trees to provide a moderate level of visual connectivity and help form a loosely-knit community of lifestyles centered around the roof.